NHRA is a little unique among the major motorsports sanctions. 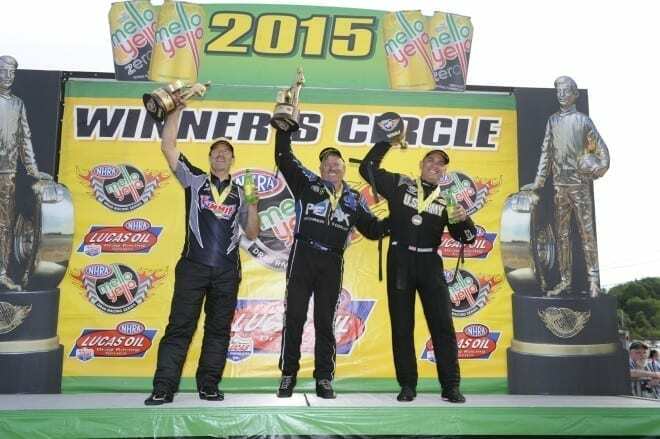 Of the three Mello Yello Drag Racing Series winners last weekend in Epping, the youngest was Tony Schumacher at 45. Pro Stock winner Greg Anderson is 54 and John Force is 66. It was not some sort of fluke that three drivers aged 45 and up won because all three are serious contenders for both wins and championships. Schumacher is the defending Top Fuel world champion. Force was last year’s Funny Car runner up and he’s happy to tell you he’s not ready to give anything up just yet. While Anderson missed part of last season after having heart surgery and ultimately missed the championship Countdown, he’s absolutely back in the winning form that’s led him to the title four times before, leading the Pro Stock points and scoring three wins so far this season. Consider that in IndyCar, drivers racing much past 40 is unusual. 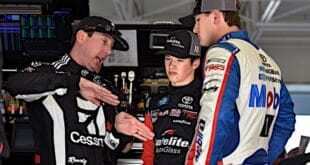 In NASCAR, once drivers hit the magic 4-0 the talk always starts. When do you think he will retire? Certainly by 50 most have at least planned the retirement tour if they are still driving. Top rides for older drivers are few and far between despite the experience they bring to the table. It’s always been accepted that drivers past a certain age experience a drop in performance thanks to slower reactions and reflexes, but drag racing lives on those things so why does it seem less of a factor for the straight-liners? So perhaps it’s a question of stamina more than a question of reflexes after all. And perhaps in drag racing, when stamina is not vital, with all that experience garnered over years making passes down the track comes the sharpness of focus needed to really excel. 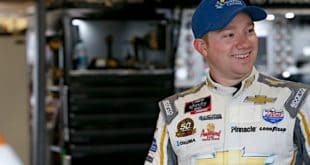 * The seventh annual Eric Medlen Memorial Golf Tournament, an annual event hosted by Morgan Lucas Racing and benefitting the Peyton Manning Chidren’s Hospital at St. Vincent, is scheduled for Thursday, September 3rd, just before the U.S. Nationals. The tournament is one of the largest charity events in drag racing. * Congratulations to Bob McDonough, winner of our VIP NHRA experience with NAPA driver Ron Capps. Bob and a guest will be going to the Thunder Valley Nationals at Bristol Dragway this weekend and will have the opportunity to meet Ron and his team and enjoy a day at the strip. Watch for details in the coming months – we’ll be offering another VIP race experience to another lucky reader for the Carolina Nationals in September! 2013 – Won 16th NHRA Mello Yello Series Funny Car world champioship at the age of 64, the oldest world champ in NHRA history. 2007 – Sidelined for end of season with serious injuries from an accident in September in Dallas. 2002 – Won 10th consecutive NHRA Funny Car championship. 1994 – Became (and still is) the winningest Funny Car driver in Funny Car history. 1987 – Scored his first career victory. Some Things Most People Don’t Know About John: It seems odd for someone who has been on the scene as long as John Force for there to be anything people don’t already know, but Force has seen so much and done so much that he has an arsenal of stories a mile deep. Is there anyone who can tell it better than John Force himself? Let’s let him take this one. Although Frontstretch primarily covers the professional NHRA categories, that’s by far not all there is to NHRA drag racing. In addition to the four Mello Yello Series categories and the Pro Mods, also a professional division, there are all the classes that make up the Lucas Oil Drag Racing Series, otherwise known as the sportsmen. They are what you might think of as the undercard at the Mello Yello Series events, but there are seven regional LODRS divisions and they each run their own schedule of regional events. The categories that make up the LODRS range from Stock and Super Stock racers that look like regular street cars to Top Alcohol Dragsters and Funny Cars that bear a strong resemblance to their Top Fuel counterparts. The number of combined championships between the three Mello Yello Series category winners last weekend in Epping. Top Fuel winner Tony Schumacher has eight championships, Funny Car victor John Force has 16 titles, and Pro Stock’s Greg Anderson has won the championship four times. The NHRA Mello Yello Drag Racing Series is on a busy swing into the hot summer months and continues on to Bristol Dragway this weekend for the Thunder Valley Nationals. You do not want to miss this one because it is one of five live shows on tap for this season.